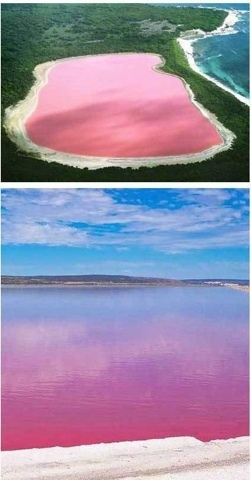 This pink coloured lake is located at Western Australia.. nice huh? Qouted from Wikipedia "The lake is not always pink in colour but the distinctive colour of the water when the lake is pink is a result of the green alga Dunaliella salina, halobacterium Halobacteria cutirubrum, and/or high concentration of brine prawn. Once the lake water reaches a salinity level greater than that of sea water, the temperature is high enough and adequate light conditions are provided, the alga begins to accumulate the red pigment beta carotene. The pink halobacteria grow in the salt crust at the bottom of the lake and the colour of the lake is a result of the balance between D. salina and H. cutirubrum."